Freedom's Lighthouse: New Anti-Obama Billboard Surfaces in Marshall, Texas: "Embarrassed Yet?" New Anti-Obama Billboard Surfaces in Marshall, Texas: "Embarrassed Yet?" 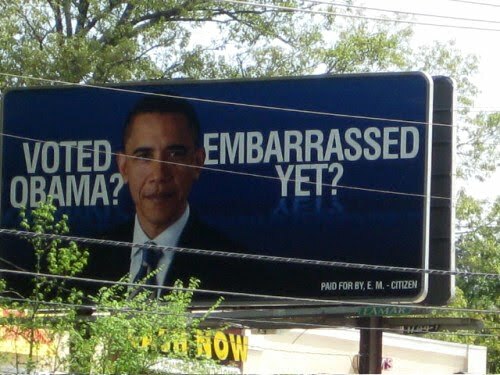 A new anti-Obama billboard has surfaced in Marshall, Texas, that asks a question every Barack Obama voter should ponder: "Embarrassed Yet?" Obama won the 2008 Election by 8.5 million votes. All it will take is for less than 10% of his 66.8 million votes to be "embarrassed" about their vote for things to be very different in 2012! Baaahahahahahaha!!!!!!! I'd sure be embarrassed!!!!! !